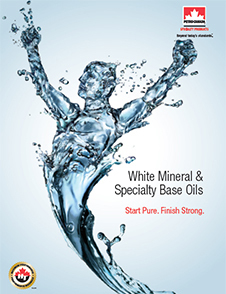 White Mineral Oil (100%). PURETOL™ 9D by Petro-Canada Specialty Products acts as a lubricant, emollient, smoothing, softening and moisturizing agent. It provides the softening, lubrication, emolliency, smoothing and moisturizing properties to beauty products. 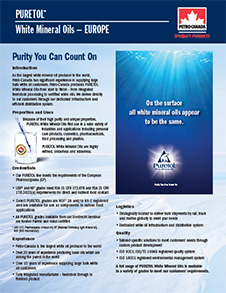 PURETOL™ 9D is used in baby oil, skin lotions, sunscreens, lipstick, makeup and hair care products. It meets USP/NF, FDA 21 CFR 172.878, FDA 21 CFR 178.3620(a), Kosher Pareve and Halal requirements. It is listed on AICS, IECSC, NZIoC, PICCS, Japan and Korea inventory.